One of these days I’ll go through my recipes and add a “Pickl-It How To” section since it is a little different than a mason jar ferment. But in the mean time I’ll tell you how I adjust the recipes. In my recipes, if it gives an amount like a tablespoon or a teaspoon and asks for whey or a starter culture, use the below recommendations for salt and leave out the whey or starter culture. One thing about the Pickl-It that I found out while talking with Kathleen is that the airlock works so well, you should be able to use less salt. Pickl-It recommends using a 2% solution for most vegetables, including sauerkraut. You can read about their brine suggestions here: Brine Recommendations. I do use a scale now to measure my salt (I use one for many different reasons in the kitchen and for weighing packages and for weighing dye to color yarn, it gets used a lot). The reason for this is different salts weigh different amounts. A tablespoon of salt can vary from 10-16 gms. For consistent results, weighing the salt is your best bet. You can do this just once and figure out how much your salt weighs. So how do you figure out how much salt to use? For vegetables that use a brine, use 19 gms of salt per 4 cups of water. I make my brine a gallon at a time and store it in the fridge. That’s 76 gms of salt per gallon of water. For self-brining vegetables like sauerkraut or shredded carrots, use 22 gms of salt per 5 lbs of veggies* (4.4 gms per 1 lb or 8.8 grams per 2 lbs and so on). *This amount has been adjusted. Formerly 19 gms per 3lbs was recommended. In a Pickl-It, a starter culture is normally not necessary. Lactic acid bacteria (LAB) are abundant and are everywhere, especially on your fresh vegetables. In most cases, all that is needed is salt. Whey is unnecessary and can influence the taste of the ferment in a bad way but a starter culture like Caldwell’s can give your ferment a boost if fermenting with nothing but salt makes you nervous. I’ve been fermenting with just salt since I received my Pickl-It’s and have been nothing more than happy with the results. There are some cases where I do like to use a starter and this is when I’m using something that has been cooked, like my Fermented Bean Dip, White Bean Hummus, Roasted Red Pepper Hummus and roasted beets (no recipe yet but soon). Another case where you might want to use starter is if you are using a previously frozen vegetable. I had a reader ask once if using frozen brussel sprouts would work for the Brine Pickle Brussel Sprouts. Since freezing can kill off some of the bacteria, this is a case where using a starter might be a good idea, just in case. If you chose to not use a starter, there is no reason to add more salt if you are using a Pickl-It so just omit the starter. So with a Pickl-It, starter is not necessary and if no starter is used, no extra salt is needed. Scrap the Loose Lid and No Burping Needing! Lastly and probably obviously, my recipes state to either cover loosely or to cover tightly but burp the jar a couple times throughout the day. Since the Pickl-It has an airlock, there is no need to release the gas since the airlock does that for us. Thank you Pickl-It! Now you are ready to use any of my ferment recipes in a Pickl-It jar. If you have any questions about this, just let me know. The following recipe is how I make a basic sauerkraut in a Pickl-It. I like onions in my sauerkraut and I had a pretty small head so I included extra onions in this recipe. Either using a knife, mandolin or food processor, shred cabbage and onions finely. Place in a large nonreactive bowl and sprinkle salt over it. Mix well and let set for about 15 mins. This should help release the juices. If there still isn’t much juice, you can pound the cabbage with a kraut pounder or a large wooden spoon. Pack the cabbage into your vessel (the 1.5 liter jar was perfect), pounding it down as you pack. 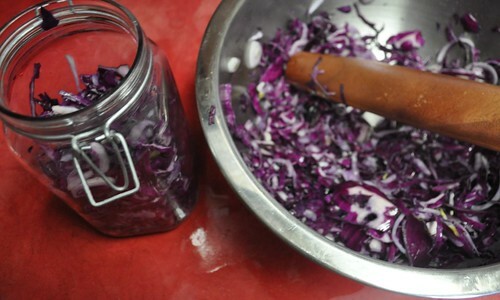 By the time you get it all in the jar, you should hopefully have enough brine to cover the cabbage. If not, you can add salt brine on top. This sauerkraut juice is really good for you so I usually add some brine to top it off anyway. If your jar isn’t at least 75% full, you’ll want to add brine to bring it up to that level or higher (within about 2″ of the rim so the cabbage has room to expand). To keep sauerkraut pieces from floating up, you can either use peels from a carrot laid over each other like Pickl-It suggest here: Food Poking Above the Brine. For mine, I cut up one of the cabbage leaves into strips and laid they criss-cross over each other and then put the Dunk’r on top of that. Worked beautifully! Using a whole cabbage leaf to cover the entire top makes it difficult for CO2 to escape, layering pieces allows the air out easily. Let set on your counter for 3-10 days depending on the temperature (warmer temps culture faster). You should notice lots of bubbles and the cabbage heaving up after a few days. Once this activity slows down, it’s time to place in cold storage (refrigerator or cellar below 55F). It’s best to let sauerkraut age at least 10-12 weeks. Many people claim sauerkraut tastes it’s best after 6 months. I’ve yet to let a batch go that long. I get impatient and eat it up too fast! When you place it in cold storage, use the mini airlock that came with your jar until the ferment is no longer active. If you pop the plug in right away, it’ll probably pop out. Once it’s no longer active, you can switch tops with a regular fido jar or put the plug in the grommet hole. When your jar falls below 50% full, you’ll want to repack it in a smaller jar to keep the sauerkraut from oxidizing. Isn’t it pretty? I love purple sauerkraut! I have been wanting to get ahold of some Pickl-It jars so I can get started. Is there any other place to buy them besides their website? I have emailed and emailed and do not get any response. I am a military wife living overseas at an APO address and I wanted to check to make sure they would ship to me…….but no response. Any ideas? I just moved my jar with the mini-airlock to the fridge. How do I know when it’s ready to plug the grommet hole? And thank you so much for posting this recipe! Unfortunately the “Sauerkraut Recipe 101” on Pickl-It’s site is a broken link and they haven’t responded to my request for a recipe. Thanks for posting your method of using the Pickl-it. I have made sauerkraut in my Pickl-it probably 6-7 times. The first two times, it turned out great. I used a 2% brine (suggested by the makers of Pickl-it), and it usually only needed to ferment for 3 days before I transferred it to the fridge. The next couple times I made it, it didn’t turn out as well. It developed a really soft texture and became a little bitter. I ended up throwing it out. This last time I made it, I used a little more salt. I mixed salt in with the cabbage as you suggested above and let it sit for a little while, put it in the Pickl-it, some brine came out of the cabbage, and then I topped it off with 2% brine. It fermented for 2 days, and then was in the fridge for 6 weeks. It doesn’t taste as sour as my previous versions, but it is still crunchy, which is great. However, it is a bit salty tasting still. I guess I am having a hard time figuring out exactly how much salt to use. I disagree with Pickl-it that 2% brine solution is adequate. Maybe that’s why they took their recipe down? Also, what is your opinion about the fermentation times? 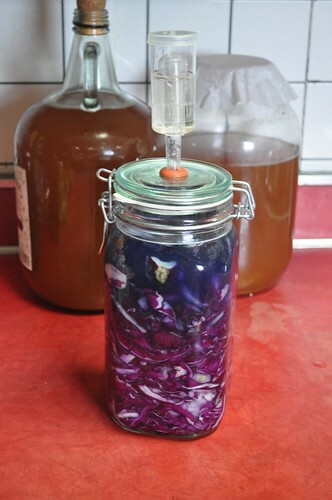 Most websites and blogs say to ferment kraut for weeks at a time and THEN transfer to the fridge. Do you have experience with this?